Sometimes I’m not sure whether to file posts under my diary or in the health conditions section. It’s been a little while since I’ve done a personal update but I had a doctor’s appointment last week and, as always, I learned something new. The other day when I said I was feeling better than ever, I wasn’t exaggerating. I no longer have the fatigue I was suffering from last year and my mind feels sharp and focused. But one thing does persist. My tinnitus. At the start of this journey I mentioned the high-pitched ringing in my ears, which got progressively quieter over the last six months. But it’s still there. Quiet, but still there. Some people say tinnitus comes on for “no reason.” And it stays or goes for “no reason.” Well, if you’re getting to know me you probably realized by now that I don’t believe in “no reason.” There is always an underlying cause. I spent the last year digging into every possible corner of the unexplained health issues that plague us. From nutrient and mineral deficiencies to viruses and bacteria to hormone dysfunction – my mission is to find (and help others find) the root cause of their health problems. I’m new to all of this but something that is becoming very apparent to me is that most of our health problems are related. And this folate caper is the key to unlocking many of the doors that stand between so many people and better health. Actually, come to think of it, yes. Yes I do. I don’t have fibromyalgia or any pain, but very occasionally – perhaps every three weeks for about 30 seconds, I’ll feel a slight tingling and numbness in my fingers. It’s usually just on one side and is barely noticeable. I always thought it was a B12 issue, but it shouldn’t be going on anymore because I take methylcobalamin shots every two weeks. And when I think back to last year before I found out I had MTHFR, the numbness was more pronounced and happened more often. As I told my doctor about this she started nodding. Multiple recent studies have found that perhaps half of fibromyalgia patients have peripheral nerve abnormalities, ranging from a loss of small fiber innervation to nerve damage. Now as I said, I do not have fibromyalgia symptoms such as pain, burning or serious fatigue. But as we know, fibromyalgia patients often have MTHFR mutations and methylation issues can exacerbate the problems they face. This draws a huge connection between methylation gene defects and the constellation of symptoms that face both fibromyalgia and ME/CFS patients. Furthermore, patients who have small-fiber polyneuropathy (SFPN) may not present with any pain but may have other symptoms: abnormal blood pressure, gastrointestinal disturbances and tachycardia for example. Well guess what? A review of my vitals and symptom reports from my last few appointments showed blood pressure fluctuations, gastrointestinal complaints and a couple of instances where my resting heart rate was in the 90s. That’s not technically tachycardia but it’s pretty close. The next step for me was to have a quick scan to look for physiological evidence of SFPN. My doctor uses Sudoscan (pictured), which is a simple noninvasive tool that evaluates sweat gland function through electrodermal response in the hands and feet. 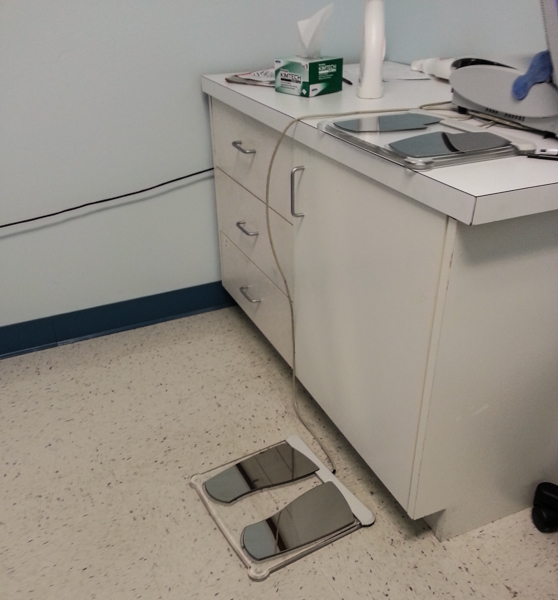 I just had to stand with my hands and feet on four plates for a few minutes while the scan completed. I’m not sure what measurements the results are done in, but I came up below normal in both of my hands (feet were good). The scale showed a range from small fiber neuropathy to myelin damage to nerve damage. I found an excellent blog post that really explains this SFPN issue in detail so I will refer you there for further reading. It’s prompting me to bring up another biomarker I’ve had since I began seeing my doctor for MTHFR-related issues last year. I haven’t mentioned this yet on the blog because I couldn’t explain it (and before everyone runs to comment that I should get tested for Lyme disease: I have been and I don’t have it – though under-diagnosed Lyme is endemic and my next post will be about that). I’ve had low CD57 lymphocyte counts every time they’ve been measured since last August. Now, there’s a whole host of things besides Lyme disease that can cause low CD57s but I also did testing to rule those out. My doctor has always said she sees these numbers in her chronic fatigue patients. As Mr. Johnson (founder of Phoenix Rising) explains in his blog post, these low numbers are more a marker of chronic infection and immune dysfunction (autoimmune issues were also present in a third of the patients in the referenced study). And immune dysfunction is associated with small fiber neuropathy. I had my CD57 tested again last week but do not have the results yet. My doctor is convinced that this is all related to the MTHFR, especially as I am feeling so much better as my treatment progresses. I’ve even been able to reduce the amount of thyroid medication that I need to take. My number one complaint right now is the tinnitus, which is still there albeit at a much lower volume than it was last year. She recommended that I continue my B vitamin supplementation, which includes the active forms of all the B vitamins, methylcobalamin injections twice a month and the glutathione precursor supplement that I’m taking. She thinks that I may have been even lower on the scale last year but we don’t have a baseline because I did not do a scan back then. The tinnitus becoming quieter is an improvement, as is the fact that I am no longer tired or experiencing any sleep problems or other issues. She thinks that the untreated MTHFR over time could have caused the trouble. Remember that many of my more obvious problems began when I started taking high doses of synthetic folic acid and cyanocobalamin along with drugstore-quality prenatal vitamins (before I knew better). I’m sure my health has been impaired by MTHFR mutations but the underlying issues were intensified by the wrong forms of vitamins. Of this I am convinced. **Update 11 Apr 2014** – I’m almost certain I have figured out that the cause of my tinnitus was a fluoroquinolone toxicity reaction. Read more at the link. Do you experience any symptoms of small fiber neuropathy? New research reveals that MTHFR could be a riboflavin deficiency. See Chris Masterjohn’s podcast on riboflavin. Just make sure for Lyme testing that it was either from Igenex or the Ispot test. No other test will be as accurate. I have Lyme so I’ve researched this at length. Gosh, I could write a book on my medical misadventure! I was just diagnosed with Guillain Barre (after mos. and mos. )” and when I asked my doctors could my faulty MTHLR gene be at the basis of this, they acted as if I was crazy. One doctor said” I know nothing about that” Well after 3 1/2 mos. of hell…I’m on my own figuring out how to get healthy again. Good pure nutrition, supliments for my nerves, Reiki, visualization, epsome salts baths, Qui Gong, yoga, etc and I feel like I’m getting somewhere. Its not easy! Good thing I was healthy and strong before this. A vegetarian (organic), using all natural body products,house cleaning products and the correct suppliments for methylation, active…yoga,etc. A trip to the dentist started all this! I didnt think about what was used to clean my teeth! Faulty methelation is in my family and we all have to be extra dillagent in all that we do! Thanks Andrea, what part of the country do you live in, maybe some of us are able to see your Doctors. I’ve had many of these symptoms in the past, particularly tingling; in the case of tinnitus I actually found it was linked to my posture. I’d been standing with my shoulders rolled forward, my lower back arched and my neck craning outward. Basically, this was causing a lot of tension along my Superficial Back Line, which, incidentally, is also the area along which a lot of my tingling spots occurred. Once I started standing upright and holding my shoulders back, the tension in my neck and jaw area went away, as did the nerve irritation in my jaw/ear area that was causing tinnitus symptoms as well as migraines (with tinnitus as aura). The tingling has also subsided quite a bit with increased stretching and upright posture, however I’m sure there is also and underlying genetic problem involved (like MTHFR). Thanks for sharing, Annie – I wish posture was to blame for my tinnitus! I have been on your mailing list for a while and enjoy many of your articles. Thanks for the effort that you put into making this available to the rest of us. You mentioned tinnitus at the beginning and the end of your article, but I don’t see any in-depth discussion about how it can be lessened or alleviated. I’ve had tinnitus all my life. It has become somewhat worse in the last few months. I began treatment for MTHFR about a year ago, so I’m already on the methyl versions of B, except for subligual hydroxocobalamin (B12). None of my doctors seem to be able to find anything that works. Like you, I’d really love for it to go away. It has become more of a problem recently, interfering with my hearing, rather than just a nuisance. If you have any ideas, please share! Thanks for your comment and being a reader of this site! Happy to hear that the information is helpful! Unfortunately I have not been able to completely cure my tinnitus. My doctor believes that when/if the small fiber polyneuropathy improves, the tinnitus will go away. Her instructions were to continue with the supplements I am currently taking, improving methylation and glutathione production. I did try pycnogenol for awhile and that toned the noise down a bit. I had pretty severe tinnitus. It was one of the symptoms from a very high industrial exposure to mercury. Selenium taken daily eventually made it go away. Selenium is a chelator of mercury, helping it to safely leave the body. Give it a try. Hi Donna – Thanks so much for your comment and I’m so glad that this site is helping you. Everything with the doctor I discuss in this post is covered by my insurance. But I see a MD for my MTHFR issues – she specializes in things like fibromyalgia, ME/CFS and infectious diseases. She’s awesome – people come from all over the world to see her. But unfortunately many of the practitioners that are up to speed on MTHFR issues don’t take insurance (though they may be able to prepare invoices that you can submit to your insurance). If there was a practitioner that I wanted to see who didn’t take insurance, I would call my insurance and their office and see what I could do to get things covered – please don’t let that stop you! I’m very lucky to have found a few doctors that I trust who are in my insurance network. That said, it took a lot of trial and error with ones I wasn’t happy with to get there.